I’d say “let’s just get Trump out of the way early” but these two pieces are really smart and I think they’re actually worth whatever small sliver of bandwidth you might have left for the topic. “Trump, ‘The Apprentice,’ and secular rapture” by Arlie Russell Hochschild in The Boston Globe. Although Trump is nobody’s model Christian, he has uncannily managed to appropriate the iconography of belief: images of a long-awaited judgment soon to come, when merciless vengeance will be wreaked on evildoers, wrongs will be righted, and untold blessings delivered to the deserving. This hidden source of his powerful appeal is nothing less than a secular version of the Rapture. And Diane Winston writes “‘There is Sin and Evil in the World’: Reagan, Trump, and the News Media” for the Los Angeles Review of Books. How did a lying, philandering blowhard convince millions of Americans — including white evangelicals and the working poor — that he should be their president? I blame Ronald Reagan and the news media. Going a bit further back in American history, Ann Neumann‘s latest in The Baffler is “Black Elk, Woke” is a must-read. If those headlines have you asking, “Whose Utopia Is This Anyway,” then you should probably take a look at Kate Daloz‘s latest in The New Republic. The very nature of utopian living—experiment-as-critique—offers a window into culture and counterculture in one. The insistence among nineteenth-century groups on dignified labor and workdays that allowed individuals time for study and reflection reflected an anxiety about the dehumanizing effects of the Industrial Revolution. For the young communards of the ‘70s, the emphasis on extreme austerity and the preoccupation with freedom and self-expression revealed starkly how cluttered and stifling 1950s middle-class culture had felt to its children. We also strongly recommend reading Ashley Makar‘s powerful “Aleppo is Us” in Killing the Buddha. I’m glad these images reach and move so many people. They bring attention to the Syrian war and can motivate action: support for aid work in the Middle East and for refugee resettlement in the U.S. and Europe. But I worry that the way we consume these images make it hard to empathize with the people they portray. In a time when people from Muslim countries are seen as either victims or terrorists, we lose sight of the human beings they are. We also really enjoyed a couple of recent pieces in The New Yorker. Baring’s retreats usually last two days and include ten to fifteen patients, who take turns working with her and acting as stand-ins for one another. Each session follows roughly the same order, like a religious ritual: confession, supplication, revelation, reconciliation. A malfunctioning family is wrenched into working order. The whole process takes less than two hours—a quick fix as therapy goes, which may account for some of its appeal. Ayahuasca isn’t the only time-honored method of ritual self-mortification, of course; pilgrims seeking an encounter with the divine have a long history of fasting, hair shirts, and flagellation. But in the United States most ayahuasca users are seeking a post-religious kind of spiritualism—or, perhaps, pre-religious, a pagan worship of nature. The Scottish writer and ayahuasca devotee Graham Hancock told me that people from all over the world report similar encounters with the “spirit of the plant”: “She sometimes appears as a jungle cat, sometimes as a huge serpent.” Many speak about ayahuasca as though it were an actual female being: Grandmother. Speaking of Ayahuasca, Sarah Laskow asks, “In 2016, the ‘First Legal Ayahuasca Church’ Got Shut Down. Was It a Scam — or a New Religion?” in Atlas Obscura. Scholars say, yes, there is an American Jewish accent, but it’s complicated. “Intonation has kind of been the red-headed stepchild of linguistics, where for a lot of time there was debate about whether or not it’s really part of the linguistic system, or whether it was something else overriding it, essentially,” says Burdin. It’s only been about 15 years since linguists—just a few of them, really—have begun systematically attempting to study the rhythm, timbre, intonations, stresses, and pauses of speech, and the study is still in its infancy. It is particularly murky territory in English, where melody is not as important as it is in other languages. But there are some groups whose speech, long having been described as sing-songy, is suddenly of interest to researchers breaking new ground in the study of prosody. Appalachian English is one of those. And Jewish English is another. The accents aren’t heavy, but there’s no disputing the Jewishness of “Transparent.” Jodi Eichler-Levine writes about “Transparent Season 3: The Intersectional Messiah” in Religion Dispatches. Last Saturday night, many American Jews ushered in the fall High Holy Days of teshuvah, or repentance, by attending special selichot services, praying and heeding the call of the shofar. The rest of us? We were home watching the new season of Transparent. From moving images to still, KC McGinnis writes about “Making Faith Visible: Picturing the Spiritual through the Ultimate Anguish” in Reading the Pictures. Stories about terminal illnesses are about more than death: they’re about family, medicine, finances, conflict, hope — and often, faith. Death is almost universally regarded as a topic of spiritual import, even for people who aren’t particularly religious. For a photographer telling an in-depth story where death is a primary character, faith plays a supporting role that can’t go ignored. And Diaa Haddid‘s “Postcards from the Hajj” in The New York Times were one of our favorite things last month. The whole endeavor was something of a journalistic experiment, as well as a personal journey. My editors and I decided to cover the pilgrimage not so much as a news event but as a first-person diary of observations and reflections. Far from Mecca but still very relevant, Ahmed Ali Akbar shared “This Photographer Is Capturing The Way Muslims Pray in Public” at Buzzfeed. Places You’ll Pray is a photo series which captures the different places Americans Muslims perform their five daily prayers outside the mosque and home. The photographer, Sana Ullah, told BuzzFeed in an email that she got the idea for the series when her family was at the mall during prayer time and prayed in a dressing room. 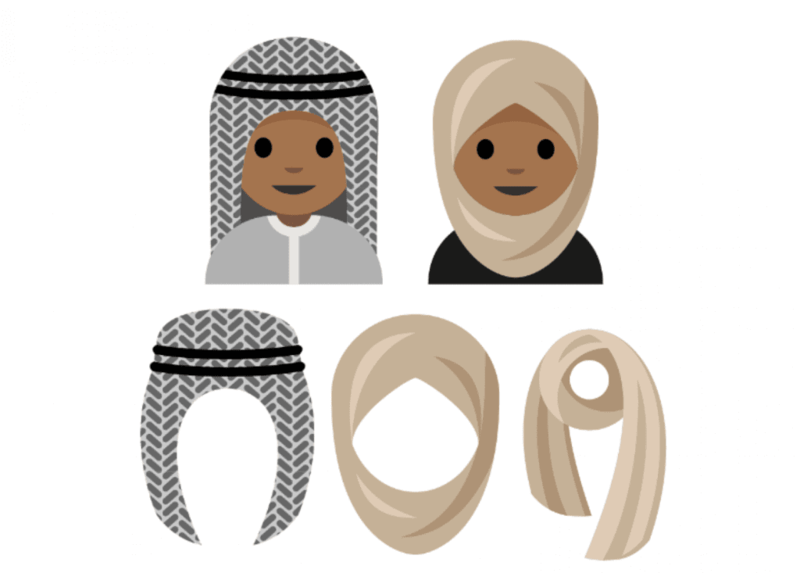 Emojis, on the other hand, are everywhere, as we learn in “There is no hijab emoji. This 15-year old is trying to change that” by Abby Ohlheiser in The Washington Post. We read two interesting stories about religion and technology in Asia this month, both in The New York Times. They’re even more fascinating when read side-by-side. As a spiritual revival sweeps China, Longquan has become a haven for a distinct brand of Buddhism, one that preaches connectivity instead of seclusion and that emphasizes practical advice over deep philosophy. The temple is run by what may be some of the most highly educated monks in the world: nuclear physicists, math prodigies and computer programmers who gave up lives steeped in precision to explore the ambiguities of the spiritual realm. The priest at Mrs. Kai’s memorial, Junku Soko, is part of a controversial business that is disrupting traditional funeral arrangements in Japan. In a country where regulations and powerful interests have stymied much of the so-called gig economy — Uber, for instance, is barely a blip here — a network of freelancing priests is making gains in the unlikely sphere of religion. Speaking of science and religion: “The Modern Mosaic of Science and Religion” by Donovan Schaefer in the Marginalia Review of Books. This is why the work of scholars in the field of science and religion studies is pressingly relevant. Mapping the interactions between science and religion is not only a theological exercise: it has direct ramifications for understanding problems in the political and social sciences. Peter Harrison’s The Territories of Science and Religion is atour de force contribution to this discussion, designed to reconstruct the intellectual foundations of the subfield while serving as a formidable work of intellectual history in its own right. If you need a break from reading, maybe take a moment to watch Brook Wilensky-Lanford featured in “In Search of Eden” on BBC4 or listen to Peter Bebergal interviewed about his book Season of the Witch: How the Occult Saved Rock and Roll. by Marc Maron on his podcast “WTF,” or listen to Kristian Peterson host”Josef Sorett on A Religious History of Racial Aesthetics” on his First Impressions. When you’re ready to get back to reading, Josef Sorett also contributed to the “Religion, Secularism, and Black Lives Matter” forum on The Immanent Frame. What role does religion play in this movement for Black lives—if any? What are the modern day connections between religion, secularism, and racial justice? Does a justice movement have to be openly religiously affiliated to invoke a sacredness? And yet I now feel compelled to change course. I am walking away from the law. I’ve resigned my position as a law professor at Ohio State University, and I’ve decided to teach and study at a seminary. Why? There is no easy answer to this question, and there are times I worry that I have completely lost my mind. Who am I to teach or study at a seminary? I was not raised in a church. And I have generally found more questions than answers in my own religious or spiritual pursuits. But I also know there is something much greater at stake in justice work than we often acknowledge. Solving the crises we face isn’t simply a matter of having the right facts, graphs, policy analyses, or funding. And I no longer believe we can “win” justice simply by filing lawsuits, flexing our political muscles or boosting voter turnout. “Apocalypse Meow: How a Cult That Believes Cats Are Divine Beings Ended Up in Tennessee” by Bob Smietana in Nashville Scene. And: “Pope Francis Hosts Feathered Serpent God as Part of Deity Exchange Program” in The Onion. 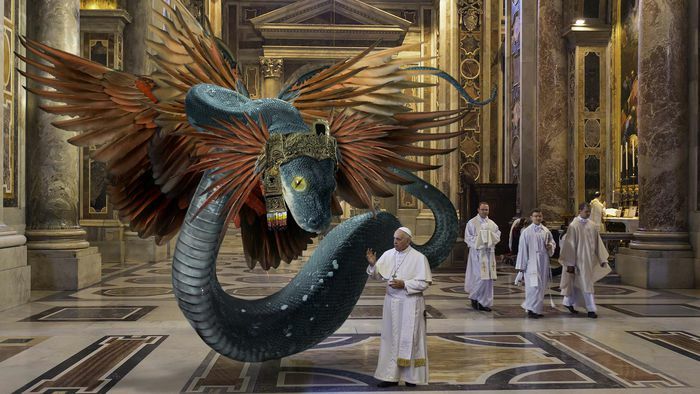 In an effort to strengthen their relationship and foster interfaith dialogue, Pope Francis reportedly welcomed the winged Mayan snake god Kukulkan to the Vatican this week as part of a month-long deity exchange program. “We are excited to have the War Serpent staying here with us for the next four weeks, during which time he’ll be exposed to the rituals and customs of the Catholic Church, so that when he returns home he can share the experience with his adherents in Chichén Itzá and the surrounding Yucután communities,” said Vatican spokesperson Greg Burke, noting that the pontiff had taken Kukulkan out for pizza on the first night of the exchange before showing him around some of Rome’s most famous landmarks.